We took a fairly easy drive (after getting out of St. Louis) north through the cornfields of Illinois, mostly on back roads. It is remarkable in such a populous state how few folks you see in its extreme western part. 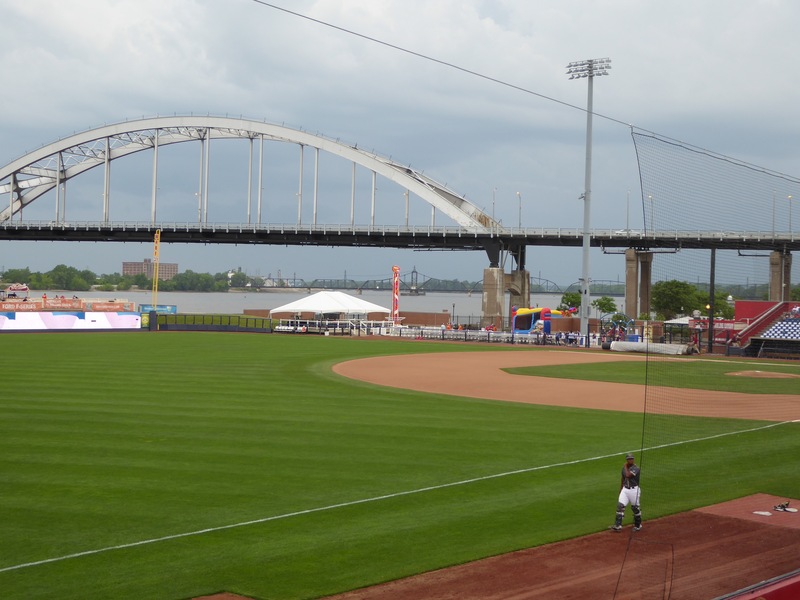 Our destination was Davenport, Iowa where the Quad Cities River Bandits were scheduled to play in a Single A Midwestern League game against the Cedar Rapids Kernels. The Bandits are an affiliate of the Astros and the Kernels of the Twins. When we arrived in town, we went directly to the stadium to buy our tickets and were told that there were none for sale. My jaw dropped and the clerk quickly explained that they had all been purchased by the Modern Woodmen, an insurance company whose headquarters are directly across the Mississippi River from the stadium and after which the stadium is named. The clerk said that the tickets would be given away free an hour before game time. We were a little late for that and the parking lot was filling up fast. We stood in the ticket line only to be told to go to the gate where we would get them. The two ticket takers insisted they didn’t have tickets, but we had to and that we had to go back to the ticket window, and only after a couple of rounds of fruitless explanation that we were denied tickets there did a young lady step up (she’d been no more than five feet away during the exchange) to offer us tickets. Goofy! The Modern Woodmen Park enjoys perhaps the most spectacular setting for a ballpark that I’ve ever seen, positioned as it is at the north end of the Centennial Bridge, right on the banks of the Mississippi. We enjoyed watching the pelicans fly up and down the river. 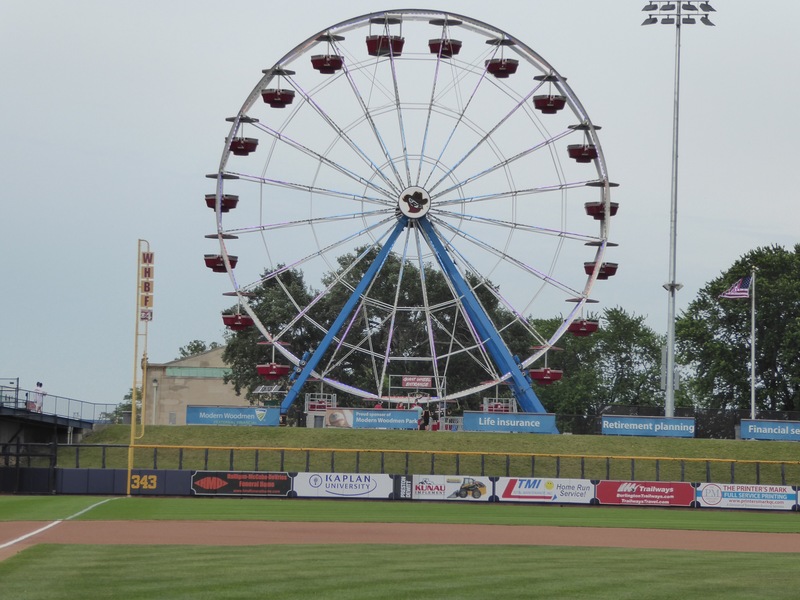 It also had the unusual feature of a permanent ferris wheel in left field. The Quad Cities include Bettendorf and Davenport in Iowa and Rock Island and Moline in Illinois, and there’s a fairly long history of minor league baseball in the area. Unfortunately, a very typical Midwestern shower arrived just as the game was about to start, so it was delayed by an hour. That, coupled with the need to make tracks tomorrow and the River Bandits 5-0 lead in the fifth caused us to leave after the game was official (five innings). We did see one player who probably won’t be with the Bandits for long. A Cuban named Yordan Alvarez was big, had an easy swing and had three hits, including a long home run, by the time we left. In style and movement, he reminded me of the young Vladimir Guerrero, but with greater plate discipline and less wasted motion. Keep an eye out for him. And finally, the eats. 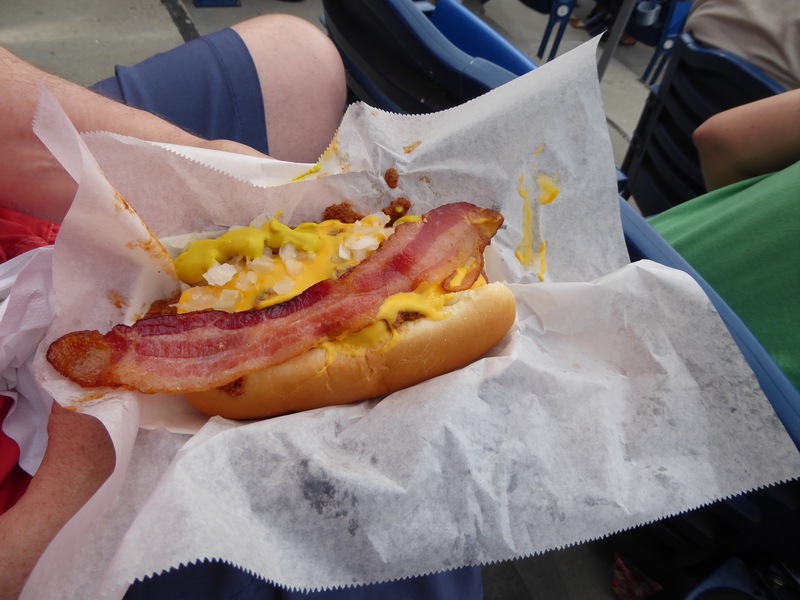 The Bandit Dog, better described as a chili cheese dog with onions, seemed the most promising, but about the only thing it is likely to deliver is late night heartburn.